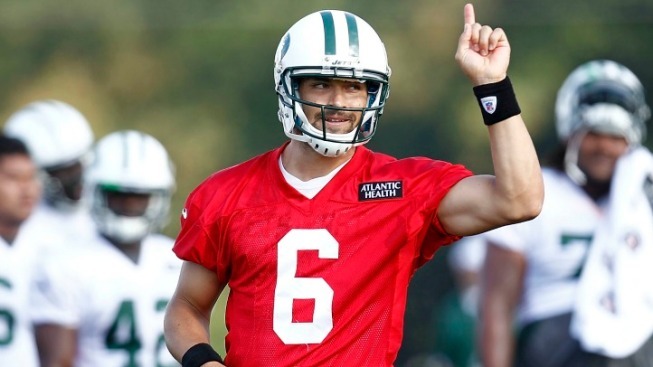 There's been no shortage of conversation about how Tim Tebow will do for the Jets this season or about how well the Jets will be able to make a two-quarterback system work for them offensively, but there's been very little about talk specifically about how Mark Sanchez will play. Sanchez has almost been an afterthought, a placeholder for the inevitable moment when the Jets turn the reins over to Tebow and let him try to run his way back into the playoffs. We're not immune to such thoughts, although the last couple of years of Jets football should have taught us all a lesson about putting carts before horses. Sanchez might wind up losing the job, but there's no sign that he's lost the team as of yet. Linebacker Bart Scott said Wednesday that the team has noticed a difference in Sanchez this season when it comes to maturity and confidence. "I think everybody has seen a difference in how he walks, how he handles it if he throws a bad ball, how he carries himself. Mark’s always been a guy that you can see his emotions and how he’s feeling about himself by his facial expressions," Scott said in comments distributed by the team. "I think now he carries himself upright and he sticks that chest out like a peacock and I think that really shows confidence to him, but it also helps and inspires his players because they respond because he’s their leader, and they’re are going to go as he goes." The most depressing part of last season was the way key members of the offense turned on Sanchez without the quarterback being able to step up and claim ownership of the unit while it was happening. It was a demoralizing season, to be sure, but you need to have a quarterback who can lead his team even when things are tough. Sanchez seemed like that kind of quarterback in his first two seasons with the team. His results weren't impressive, but Sanchez never lost the ability to rally the team to four road playoff wins on the way to two straight AFC Championship Games. For some reason, those wins have not stuck to him the same way a handful of regular season wins and a home playoff victory have stuck to Tebow. Tebow's been branded a winner, one of the reasons cited for why he should be the Jets starter, but Sanchez has won more (we're not including college in this because it hasn't done much for Vince Young's rep) and he's done it over a longer period of time than Tebow. He's far from a perfect quarterback, but he certainly seemed like a good enough quarterback to lead the Jets in those first two seasons. Last year seems to have totally outweighed those years in the minds of the Jets, no matter how much they insist that Sanchez is THE starting quarterback. This offseason could have been spent strengthening the offensive line, adding to the backfield and tweaking the receiving corps to build a group that gave Sanchez his best chance to succeed. They added a receiver in Stephen Hill, but otherwise chose to acquire Tebow and let everything else remain unchanged. You have to wonder if that's not part of the reason for the outward change in Sanchez's confidence. He's never had to earn the job and now he's been pushed into a competition that seems heavily skewed in favor of the other guy, which is the kind of thing that can lead to a stiffer spine and an increased sense of urgency. That would be the best case scenario for the Jets, obviously, even if it meant the Jets wildly overpaid for a sideshow in Tebow.